This project was completed Spring 2016. It features a chambered mahogany body, mahogany neck, flame maple top and ebony fingerboard. 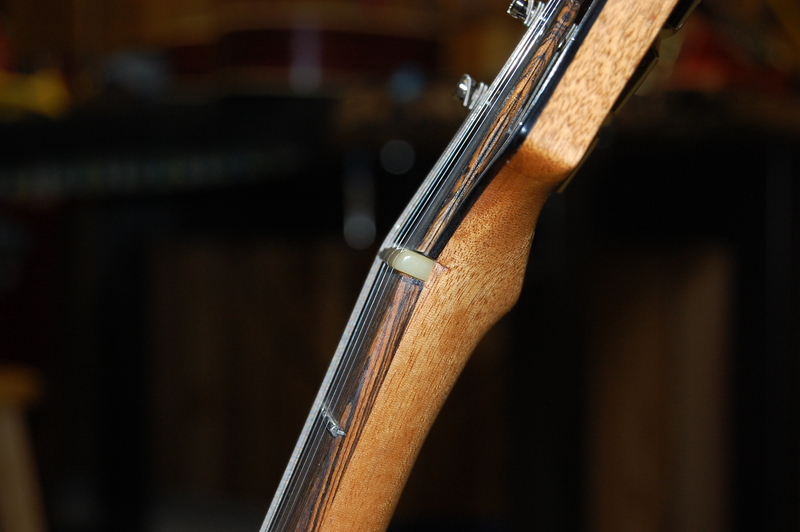 The streaks running through the ebony inspired the inlay piece. I took one look at the ebony and said to myself "That looks like the way a cool breeze feels." Once I settled on a dandy lion, I took out my pencil and started drawing up the piece. This guitar was built for a local listener funded radio station. 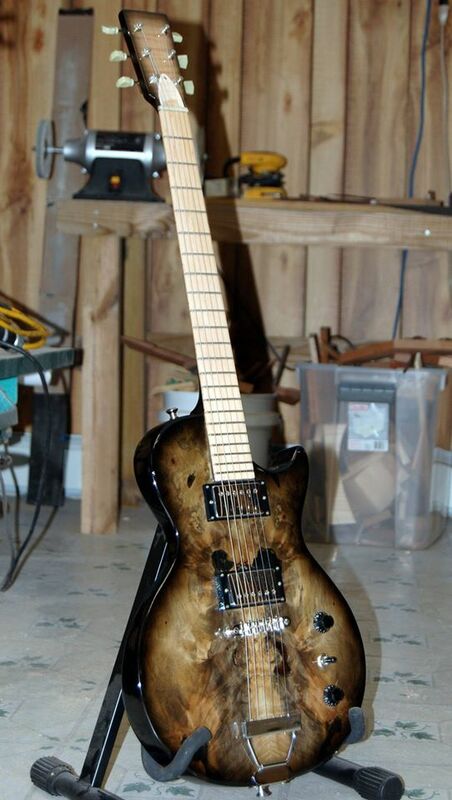 It features a one piece chambered mahogany body, quilt maple top and ebony fingerboard. 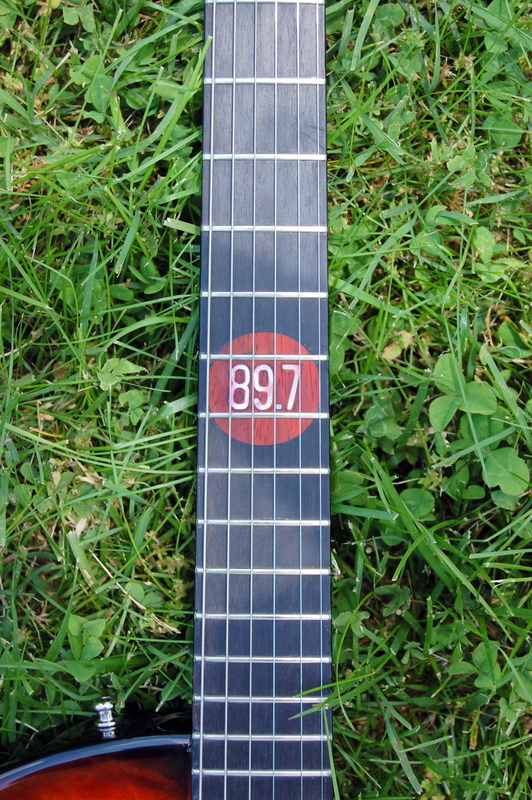 The hand cut inlays feature the stations call letters in the headstock and the stations frequency on the fingerboard. 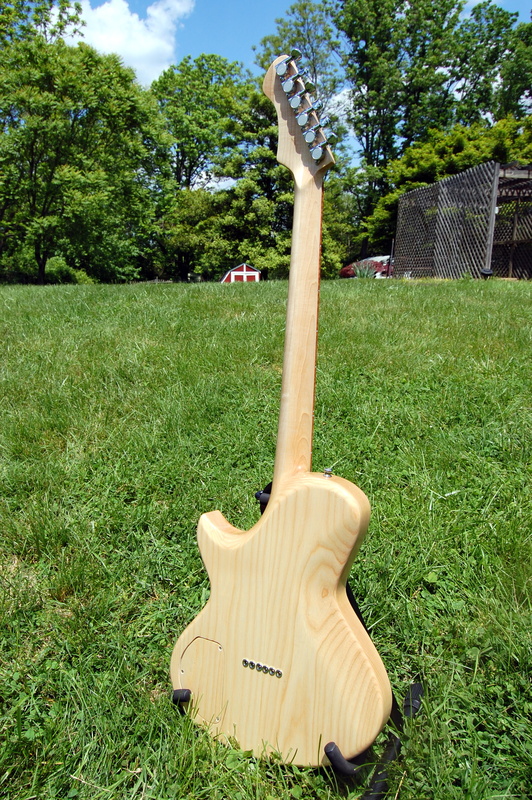 The custom F-hole was designed to accompany the shape of the body and head stock. 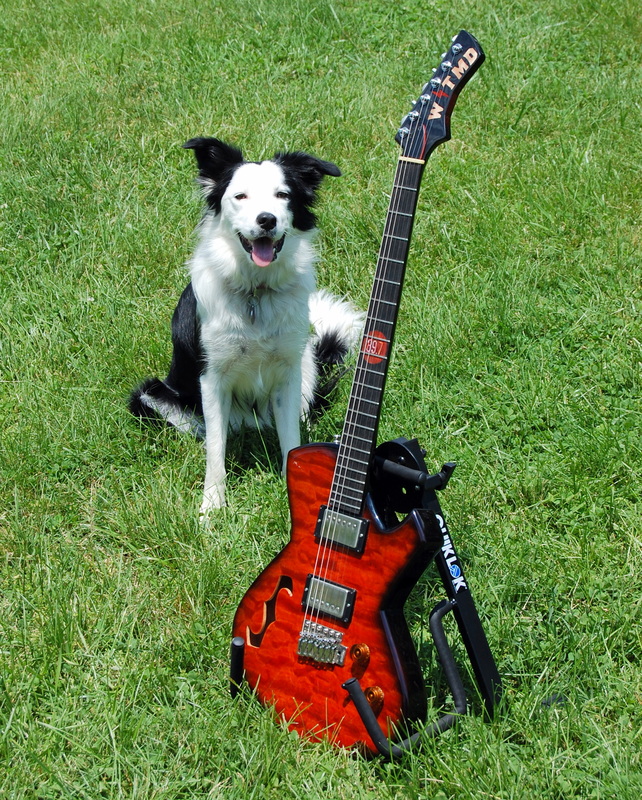 This guitar was built for a local listener funded radio station. 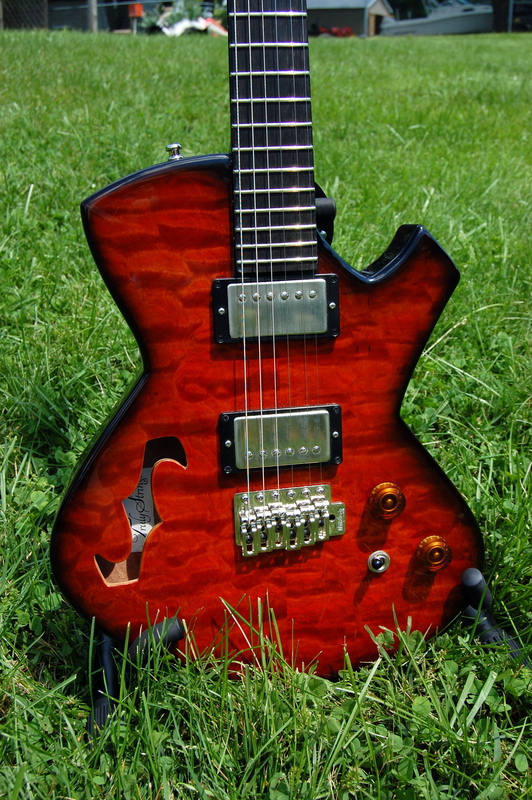 It features a one piece chambered mahogany body, quilt maple top and an ebony fingerboard and head cap. 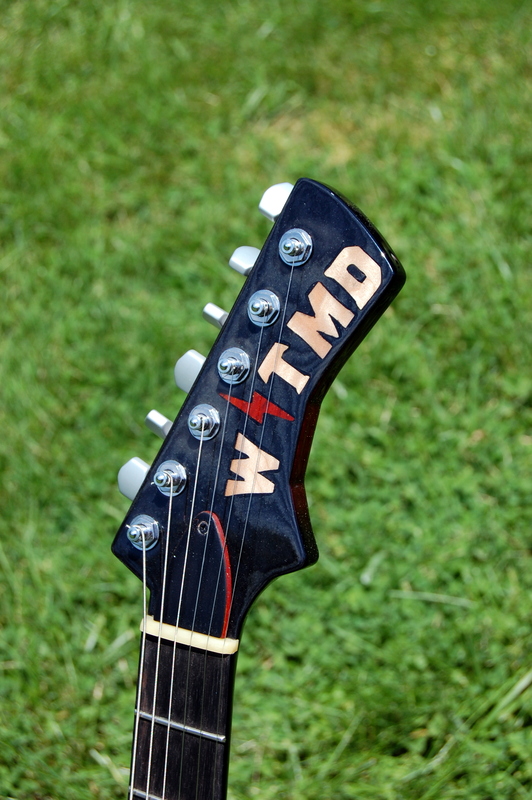 The hand cut inlays feature the stations call letters in the headstock and the frequency on the fingerboard. 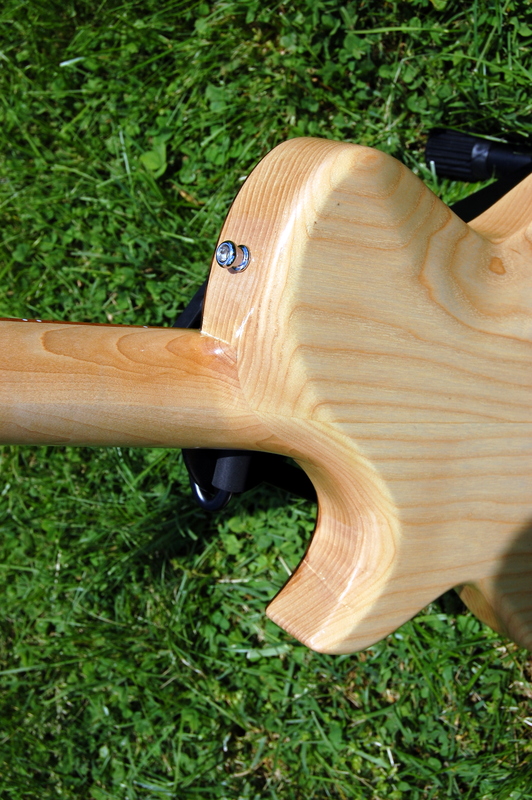 The custom F-hole was designed to accompany the shape of the body and head stock. This guitar was built for a local listener funded radio station. 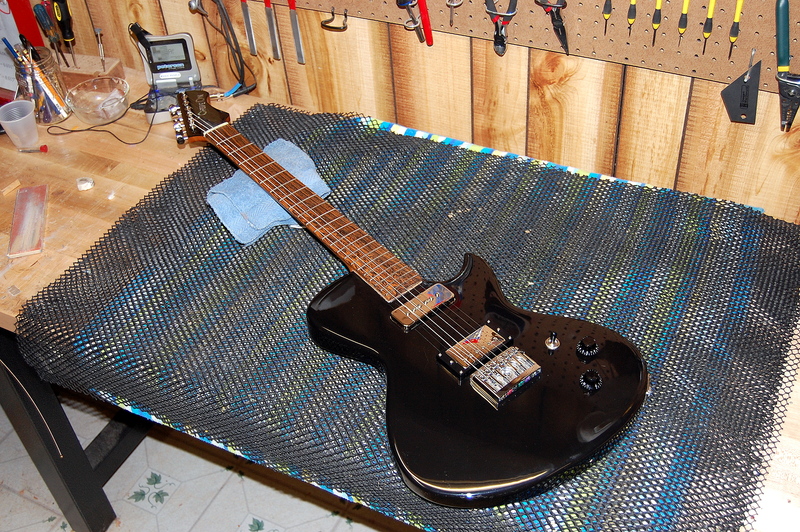 It features a one piece chambered mahogany body, quilt maple top and ebony fingerboard. 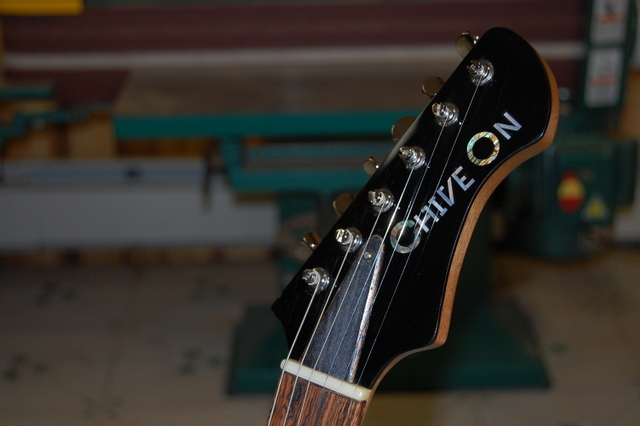 The hand cut inlays feature the stations call letters in the headstock and the station frequency on the fingerboard. 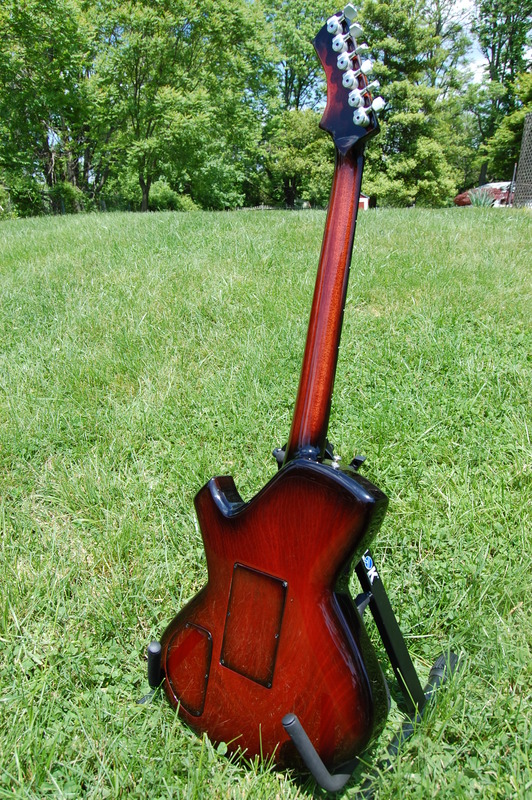 The custom F-hole was designed to accompany the shape of the body and head stock. When my Uncle Mike first told me he wanted to commission a guitar he mentioned he was looking for something modern components but with a vintage style. That was exactly what I was hoping to hear. I had been kicking around my take on a 1950's Harmony Stratotone style guitar any this was the perfect occasion to bring it to life. It is crafted from raw timber. 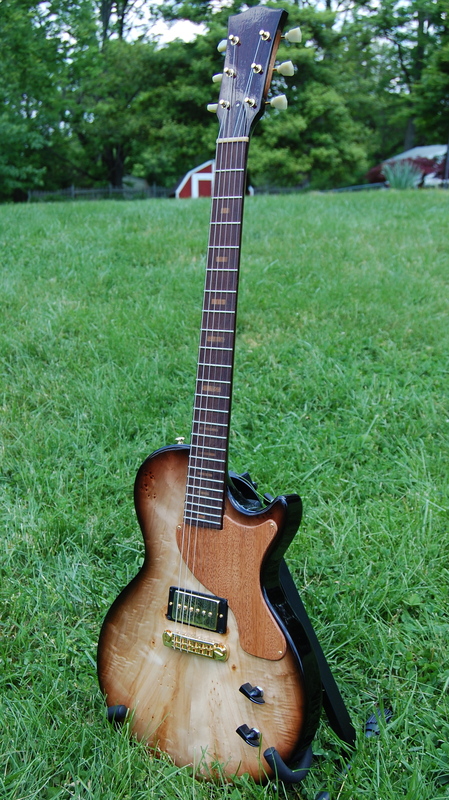 Chambered mahogany body, mahogany set neck, rosewood fingerboard and head cap. Building this instrument joy and knowing it was going to stay in my family gave me some extra incentive to build it with love. This guitar also landed me a part time job at a wood working supply store where I continue to work today. Thanks Uncle Mike! This is Rose. 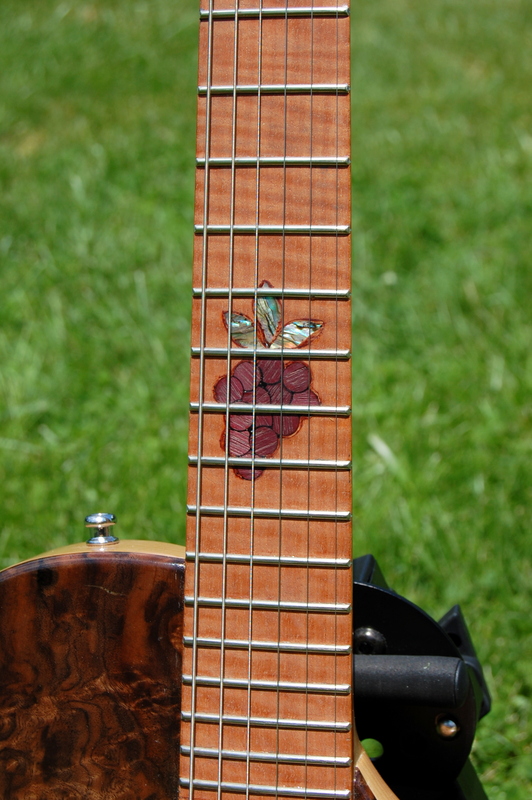 I completed this build along side the dandy lion guitar in what I refer to as my flower series. The rosewood top is what makes this one a truly unique instrument. Rosewood is traditionally used in acoustic guitar building but when the time came to bring materials together for the project, I went into my wood stash and selected my only set of rosewood to be the top. From there I ran with a rose theme. 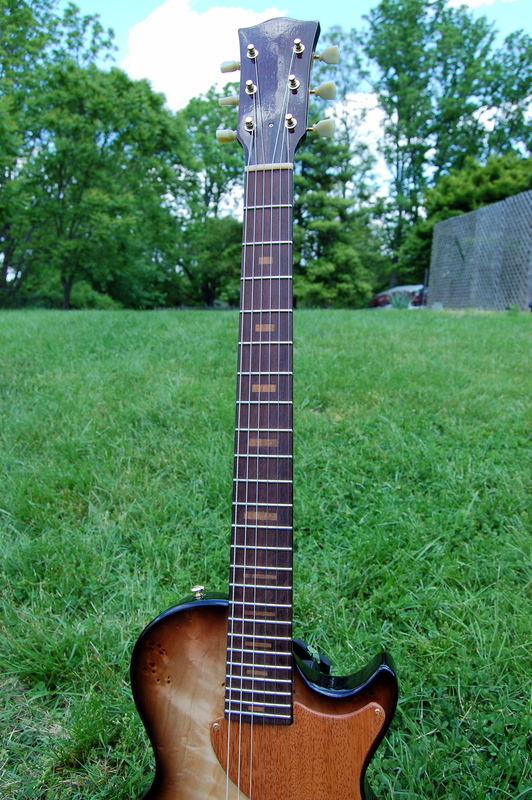 This instrument also features and ebony fingerboard, ebony pickup rings and rosewood head cap. One of the most enjoyable aspects of my form of artist expression is taking wood from all over the wood and transforming it into a single instrument. With wood coming from as far away as India and Africa, I felt that with this build. A project completed at the end of 2013 for a NYE charity auction for the Maryland chapter of The Chive fundraising group. It was the final in a batch of four instruments I was building at the time. This guitar means a lot to me for many reasons but the lesson building this instrument taught me is I have talent and I have worth and I have to share that with my community. I hope to do more charity events in the future. A project completed at the end of 2013 for a NYE charity auction for the Maryland chapter of The Chive fundraising group. Wine goes well with most occasions and this guitar was inspired by the Wine in the Woods craft show I participated in over the summer. It features a chambered ash body, walnut top, makore fingerboard and birds eye maple head cap. 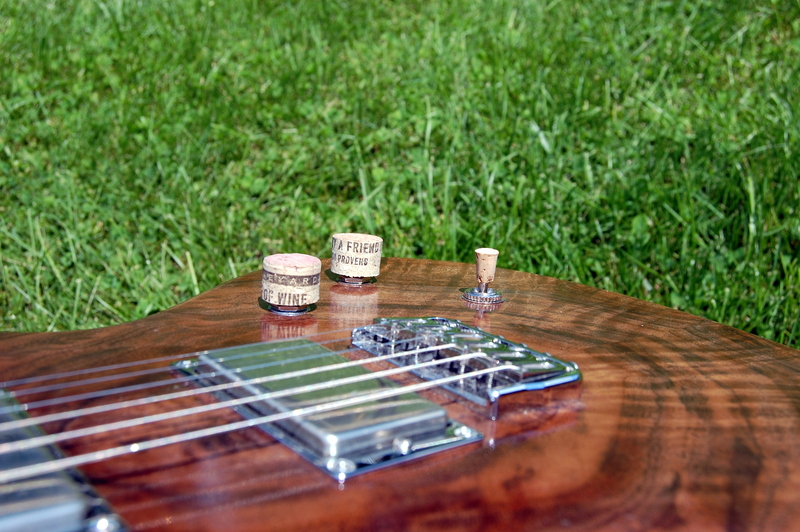 Wine cork accents for the knobs and truss rod cover along with a grape vine inlay at the 12th fret. Since I didn't find a buyer at the wine festival this guitar hung around for a few months until I decided to participate in a charity fund raising event for flood relief efforts from the 2016 Old Ellicott City flood. The instrument was used an a silent auction item in which all proceeds from the event went to the Downtown Ellicott City Partnership . Wine goes well with most occasions and this guitar was inspired by the Wine in the Woods craft show I participated in over the summer. 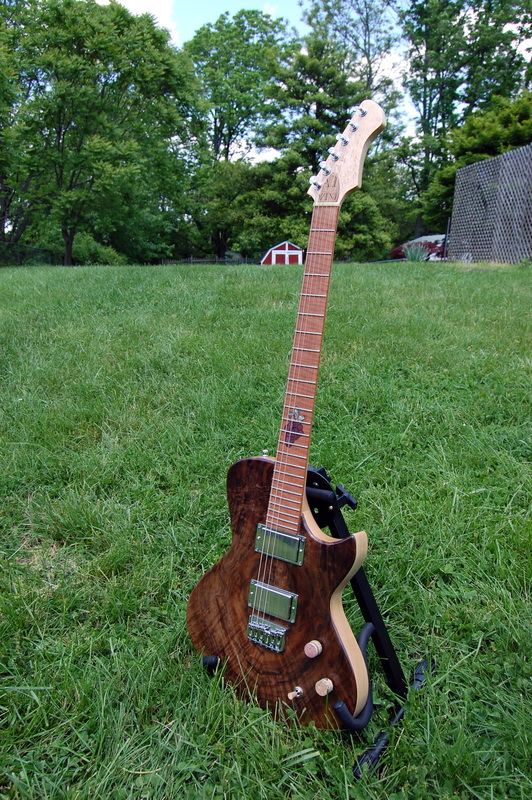 It features a chambered ash body, walnut top, makore fingerboard and birds eye maple head cap. 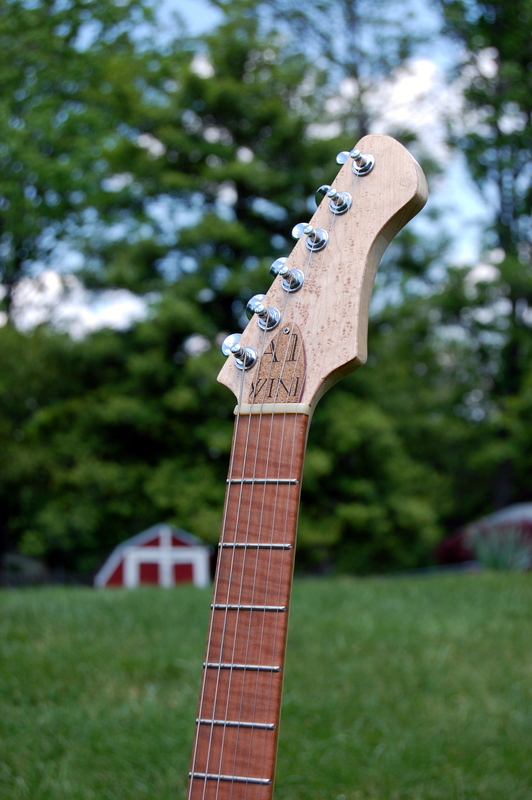 Wine cork accents for the knobs and truss rod cover along with a grape vine inlay at the 12th fret make this the perfect guitar for the wine loving musician in the family. 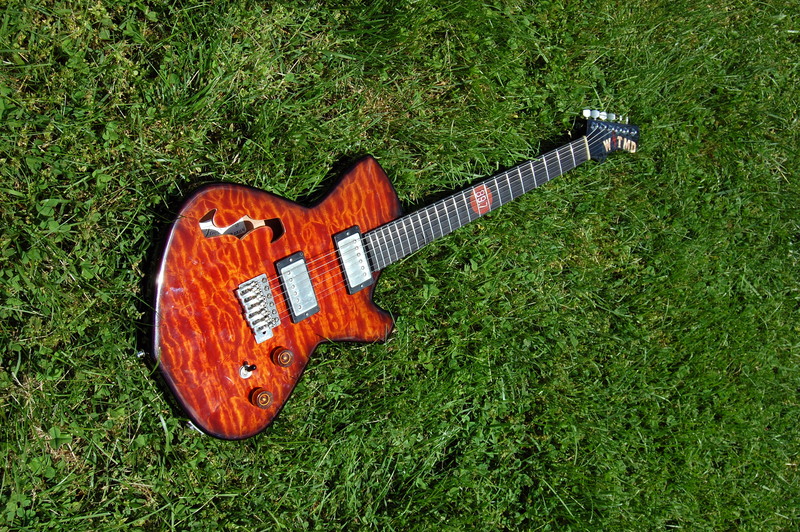 This guitar was built with the classic single cut guitar shape in mind. 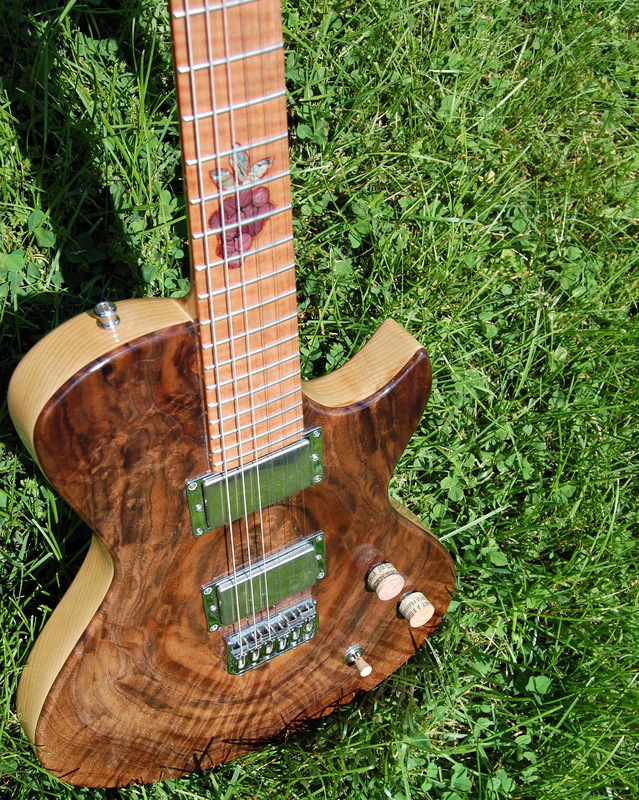 It features a spalted maple top and one piece chambered mahogany body. Koa inlays line the rosewood fingerboard and the single pickup adds to this guitars elegance and simplicity. One of the first instrument I sold and learned the expensive lesson about shipping instruments over long distances. The new owner was very pleased! This guitar was built with the classic single cut guitar shape in mind. 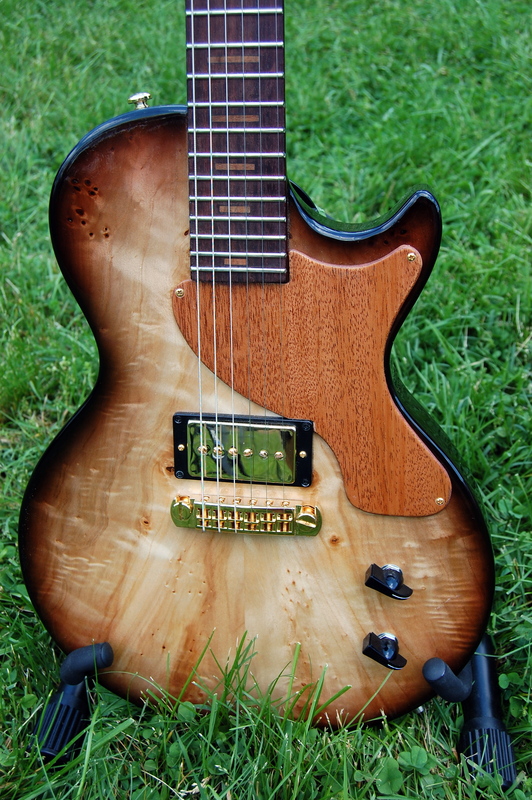 It features a spalted maple top and one piece chambered mahogany body. Koa inlays line the rosewood fingerboard and the single pickup adds to this guitars elegance and simplicity. 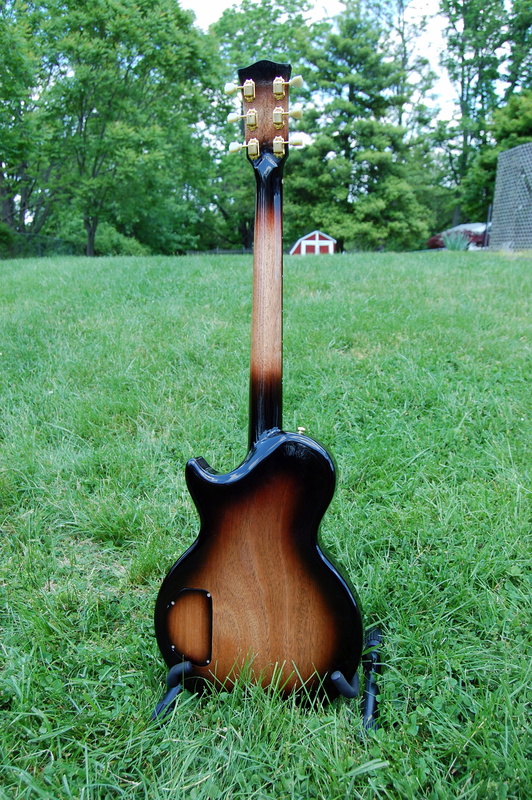 One of my very first builds that taught me a lot about finish work and neck carving. I have a lot of sentimental value wrapped up in the first few because I built them from wood left over from when my families suburban house was built in 1985. This is one of those instruments. It was sold to an owner in Oregon. Project that I started two years ago and recently completed for a seconded time with a new head cap along with a new finish.